Such a simple tale, told gracefully with warmth and humor, it is perhaps shocking that it remains such a controversial book. "Bobby was Chloe's favorite uncle. They went for long walks together," Brannen writes, and there they go, the two guinea pigs, hand in hand, strolling nonchalantly through the woods, through which shafts of light pierce. Later we see them rowing on a lake beneath the moonlit sky, and Uncle Bobby seems to be pointing out constellations to the young girl. They are truly the best of friends. However, this friendship is tested when Chloe discovers that Bobby is getting married to his friend Jamie! All of their friends and relatives whoop and holler at the news, laughing and crying and feeling generally congratulatory... all except Chloe. "I still don't think you should get married. You have me! We can keep having fun together, like always." After awhile, however, Chloe warms to the idea, and to Jamie. "I wish you were both my uncles," said Chloe. "You get your wish, sweetheart," said Bobby. "When we get married, you'll have an Uncle Jamie, too." They have this exchange whilst roasting marshmallows in a fireplace, an unfinished game of Monopoly laying behind them. Brannen has a real eye for these sort of relaxing, pastoral activities. The eponymous wedding is no different. An afternoon breeze cooled the garden. Daisies and buttercups bloomed in the grass and the air smelled like roses. All of the guests are barefoot - which isn't so remarkable since going back through the book I see that everyone is always barefoot - but even so, taking in the blooming flowers and the soft grass and the sunshine, I like to think that they're especially barefoot. That night, all in attendance dance to the light of the moon, holding hands and frolicking, the air filled with fireflies. "That was the best wedding ever," said Chloe. "I planned it all from the beginning." 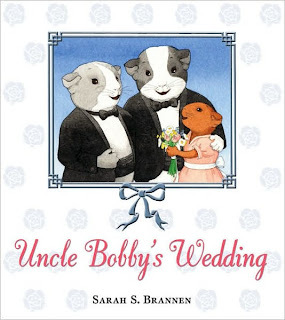 This book was first reviewed in Tales and Their Tellers 4: "We're Here, We're Queer, and We're Anthropomorphic!"